Hypoparathyroidism is a condition that occurs when the parathyroid gland do not produce enough parathyroid hormone. The circulating level of parathyroid hormone or PTH becomes low in this condition. Though the causes of hypoparathyroidism vary in each individual, all the cases share a common problem of hypocalcaemia. The severity of disease depends on the level of hypocalcaemia. Hypoparathyroidism may be genetic or acquired from surgery or injury to the parathyroid gland. Parathyroid glands are 4 small endocrine glands that are located at the neck near thyroid gland. Parathyroid glands produce parathyroid hormone or parathormone that controls the levels of calcium in the blood and bone. When the blood calcium level drops below normal, the parathyroid gland is activated and releases PTH to the blood. Calcium is responsible for the conduction of impulses from and to the brain. So the parathormone plays an important role in the proper functioning of muscular and nervous system. Eventhough the parathyroid gland is located near the thyroid gland, their functions are not related. The thyroid gland regulates the metabolism of the body and has no part in maintaining the calcium level in the bone and blood. Calcium and phosphorous in the form of calcium phosphate give strength to the bones and teeth. Calcium also helps in blood clotting, proper functioning of the muscles and nerves. Phosphorous work in conjunction with calcium to carryout all these functions. Phosphorous is necessary for energy production within the body. Hypoparathyroidism is a rare condition that occurs equally in males and females. There is no age specification for this condition. Anyone from infant to old age are susceptible for hypoparathyroidism. Insufficient parathyroid hormone is a rare condition but, can be due to any of the following categories. 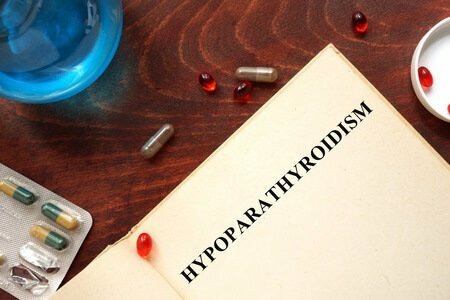 The most common cause of hypoparathyroidism is the lack of skill of surgeon where the parathyroid gland is removed along with the thyroid gland during thyroidectomy procedure. This is the most common type of parathyroid disease. It is mainly due to the decreased parathyroid tissue. The reason for the decreased parathyroid tissue could be injury or total thyroidectomy or removal of thyroid nodules. Thyroidectomy is done in case of thyroid problems like enlarged thyroid or thyroid cancer symptoms. As the parathyroid gland is closely associated with the thyroid gland, during thyroid symptoms treatment procedure, parathyroid glands may be removed. Insufficient production of PTH without a definite cause is termed as Idiopathic hypoparathyroidism. This is a vey rare condition that can be acquired or congenital. Congenital- In this parathyroid disease, the patient is born without parathyroid glands. Most cases of congenital hypoparathyroidism are noticed in babies born to mothers who had severe hyperparathyroidism during child bearing period. Blood calcium levels of mother and baby are related during pregnancy period. If the mother is hyperparathyroidic, the calcium level in the baby’s blood goes high and the development of parathyroid gland is affected. The baby is born with under developed parathyroid gland. Acquired- Acquired hypoparathyroidism is because of the autoimmune changes where the antibodies produced act against the soft tissues of parathyroid gland. As a result the parathyroid gland stops producing parathyroid hormone. Acquired hypoparathyroidism can also be due to hypomagnesaemia where in the magnesium levels in the blood go below normal. Chronic alcoholism is a reason for low levels of calcium and magnesium which leads to biologically less active PTH. Psuedo hypoparathyroidism- Like all the forms of hypoparathyroid conditions, this condition is also characterized by high levels of phosphorus and low levels of calcium in the blood. Here the patient produces parathyroid hormone normally, but their kidneys and bones do not respond to PTH. So the condition looks like parathyroid, but not in really. So the name, pseudo hypoparathyroidism. Psuedo Pseudo hypoparathyroidism- This condition is similar to the pseudo hypoparathyroidism but, with the calcium and phosphorous level normal in the blood. Toxins, drugs and infections are other causes along with hemochromatosis, doxorubicin and rifampicin. Di George’s syndrome or the congenital absence of thymus and parathyroid glands. Familial Hypoparathyroidism may also be seen associated with other endocrine disorders like adrenal insufficiency. PGA 1 etc. Parasthesia and tingling sensation in the lip, finger tips and toes. 1. Chovstek’s sign- when the facial nerve is tapped just in front of the ear lobe, contractions of facial muscles is seen. 2. Trousseau’s sign- When the upper arm is compressed with BP cuff with the systolic blood pressure maintained high for 3-5 minutes, carpal spasm is produced. Insufficient parathyroid hormone level causes, decreased calcium absorption from gut and increased calcium excretion through urine leading to hypocalcaemia in the blood. Physical Examination – Chovstek’s sign and Trousseau’s sign, Eye examination to look for cataract complication. Urine analysis for calcium level in the urine. X-ray of the bones to check the density. ECG to detect the heart activity. Arrhythmias are reported in case of hypocalcaemia and hypoparathyroidism. Once diagnosed, hypoparathryroidism treatment has to be taken life long. Doctors consider the patient’s symptoms, severity of condition and overall health in planning the treatment. Irrespective of the cause, the regime includes calcium and vitamin D supplements as the treatment aim in controlling the calcium level in the body. Calcium carbonate tablets that need to be administered orally. Calcium supplements if administered in a higher dose may create abdominal side effects. Always take hypoparathyroid medications under the guidance of your GP. Vitamin D supplement in the form of ergocalciferol and calcitriol are recommended to help the body absorb calcium. These forms of Vitamin D are more potent and stay active for longer time. The doctor may prescribe a higher dose of Vitamin D depending on the severity of the condition. 3. Diet- A high calcium- low phosphorous diet may be advised by the physician. Food that are rich in phosphorous include egg, meat etc. Carbonated soft drinks must also be avoided. 4. IV Medications- Hospitalization and IV infusion of medicines may necessary for immediate relief of symptoms. Muscle spasm and tetany need intravenous infusions. 5. Regular check ups- Regular weekly to monthly check up and blood – urine analysis will be necessary till the condition comes under control. Hypothyroidism is a chronic disorder that stays till the end of ones life once affected. So the treatment plan needs to be continued rest of the life. Doctor will change the dosage after analyzing the blood- urine report. Too much of calcium loss through urine may lead to kidney stone. So medications called Diuretics are given to reduce excess calcium excretion. Generally, no attempt is made to replace PTH as it is ineffective and expensive. Some of the complications associated with hypoparathyroidism are permanent. So early detection and treatment of the parathyroid problem is important. Prognosis is good if adequately treated with calcium and vitamin D. However, the actual result lies in the regular intake of the medicine and routine medical consultation. There are no specific preventive measures for hypoparathyroidism. However, you can discuss and get assured from the surgeon before a thyroid surgery that there will be no damage to the parathyroid glands. You need to give attention for muscle twitch and tingling sensation of lip, finger tips and toes after a surgery involving neck and thyroid.